There are only a few steps you need to follow when ordering your pens. Please note that the shipping will be calculated later as we only ship by weight via FedEx. You must follow these steps to insure we received your order and it will be exactly how you want it designed. There is a minimum order of 500pcs. You can combine orders with Pens, Key Ring Pens,and or Key Rings. The colour choices still apply. The Art Charge is $90 per pen design. If you need us to design your graphics there will be an artist charge of $30 per hour. 1. Create your pens. You are going to need to design 4 layers. Pen Back – Usually your Logo, Attraction or Company Name, Tag Line, State, City etc… or any combination of those. The Floater – What do you want to move back and forth in your floaty pen? This can be anything! a car, a mouse, a box, a rabbit, a train and even a spaceship. You can have up to 2 floaters in a single product. When creating your design, keep in mind that there are hundreds of stock images that we have created in the past that you can use for your pens. We ALWAYS suggest you call us at 1-800-325-0889 before your start your design to see if we have what your looking for designed already. Why re-invent the wheel as they say. It will be cheaper to use a design we already have then to create a new design. As you can see, we have a family of bears, a forest scene and trees already created to be used on your project. Contacting us is always the best option to ensure you get our best price. If you can bypass the setup and art charge, it will save you money and that’s a good thing. 2. 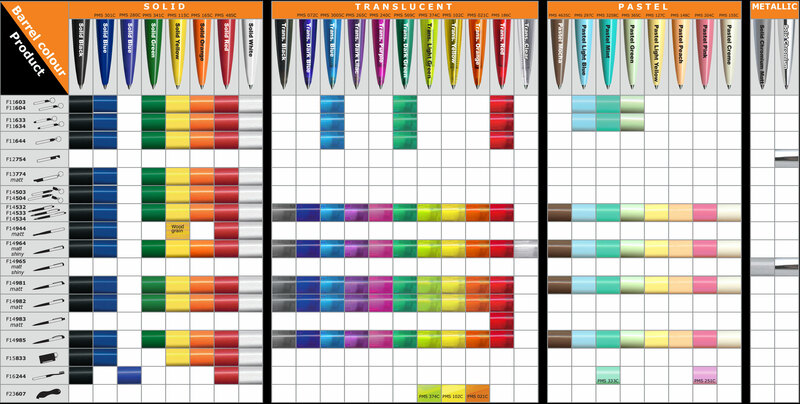 Pick the colour of your pens barrel. With orders of 500pcs you can choose 3 different colours and with orders of 1,000pcs you can choose 4 colours for your barrels or key rings. 3. Choose the Style of your pen. 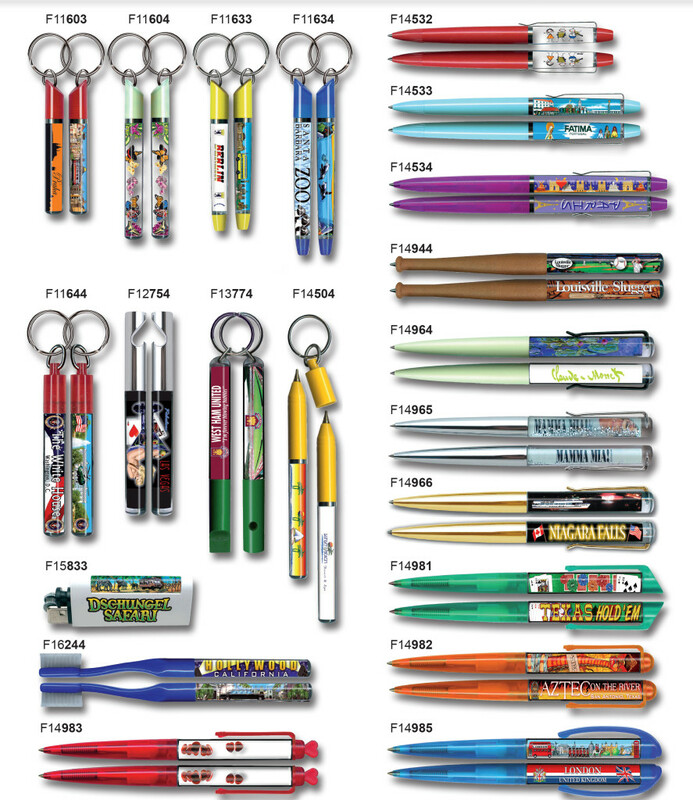 There are numerous styles you can choose from when ordering pens or key rings. Pick one that suits your business. Remember that you can combine like styles. Short barrel or long barrel sizes are most common. If you want to order your pens with rocks or other floating objects inside, please call us at 1-800-325-0889. Because there are so many variations you can have with your floating products, we HIGHLY RECOMMEND calling in your order. A representative will help you every step of the way to ensure your order is taken fast and processed correctly. In the future we hope to have an ordering system online, but to be honest, there is a lot that goes into these pens and key rings. We want you to be satisfied with your order. We want it to be the best it can be. With that in mind, we world rather take a phone call then have you order online.